Headaches are common in pregnancy. Many are benign and can be treated with home remedies. A few, however, are caused by conditions that can put you and your baby at risk. Talk to your doctor or midwife if you have a severe or persistent headache. These causes of headaches will have less of an impact by the second trimester as your body adapts to the changes of pregnancy. Other types of headaches in early and later pregnancy are caused by problems that also occur in women who are not pregnant. Boost your energy level by making sure your bedtime habits support better sleep. Meditation, yoga, and bedtime soft, peaceful music can be helpful. Fatigue usually improves during the second trimester. 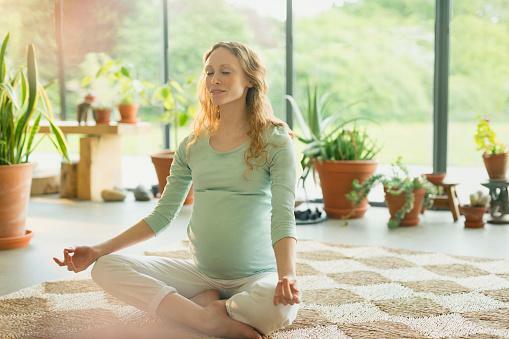 The added stress of pregnancy can cause stress-related or tension headaches. Symptoms include pain and contracted muscles in the back of the head and neck. Depression and anxiety about the pregnancy or other personal, family, job, or financial concerns can contribute to the onset of these headaches. Try to find the time to relax and meditate, and get adequate rest, sleep, and exercise. Don't hesitate to discuss this with your doctor and ask for help when you need it. Inadequate food intake due to a change in your appetite or morning sickness can cause episodes of of low blood sugar (hypoglycemia). This can trigger headaches so it is important to make sure your diet is adequate. 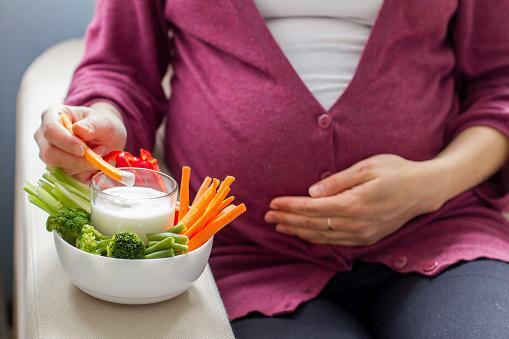 Include sources of protein and carbohydrates throughout pregnancy to keep your blood sugar levels in the normal range. Dehydration can trigger a headache. Pregnancy increases the need for adequate fluid intake because of the demands of changes in blood and other fluid volumes. Give attention to drinking at least eight glasses of water or non-sugared drinks to keep up with what your pregnant body needs. If you have clear or pale yellow urine, you are likely drinking enough fluids. Let your doctor know if your urine is dark or you are not urinating enough throughout out the day. Migraines are more common in women, however they tend to occur less frequently during pregnancy, according to the Mayo Clinic. The symptoms can be more severe in some pregnant women. Migraine headaches are thought to be caused by dilation of blood vessels in the brain. They are usually one-sided and can be accompanied by nausea, vomiting, sensitivity to light, and numbness and tingling in arms and legs. Talk to your doctor about medicines that are safe to take for migraines during pregnancy. Sinus headaches are caused by sinus congestion from a cold, an allergy, or a sinus infection. You can have a runny nose, sneezing, and fullness or pressure in the front of the head and over the sinuses. In addition to comfort remedies, treatment of the underlying problem can relieve the headache. Gradual taper off these substances will decrease your chance of triggering headaches. Talk to your doctor about tapering or stoping your prescription medicines or detox from any illicit substances. If preeclampsia-eclampsia is not treated immediately, it can cause severe complications including death of mother and fetus. A doctor will recommend early or immediate delivery depending of the severity of the signs and symptoms and the length of the pregnancy. Be sure to consult your OB doctor or midwife before you use any medications or herbal preparations during your pregnancy. Tylenol is classified safe to take in pregnancy but use it only when needed. Other medicines you would take for a headache might not be safe in pregnancy. Keep a log of your headaches to help you identify if there are specific triggers such as certain foods, odors, and lifestyle habits. This will help you figure out what to change or avoid. Eat a small snack of carbs and protein between meals to keep your blood sugar even throughout the day. Keep yourself hydrated with cold or cool water. Take a break and rest or sleep if you can. Try a relaxation technique such as meditation, deep breathing, yoga, walking or other exercise to manage stress. For stress or tension headaches, apply cool compresses on your head or the back of your neck or take a cool or cold shower. For a sinus headache, apply a warm compress around your nose, or take a steam shower or use a humidifier to increase moisture. For a migraine headache, rest in a dark, quiet room with a cold pack to your head. Get a neck or body massage, especially for a stress or tension or migraine headache. Acupuncture might also be helpful for tension headaches according to the National Institutes of Health. Seek medical help immediately if you have other symptoms that suggest preeclampsia or eclampsia in the second or third trimester. A sudden, severe or explosive headache, worse than you have ever felt, is a worrisome sign of an impending stroke. Headaches can be bothersome in pregnancy starting in the first trimester. Pay attention to the pattern and severity of your headaches so you know when you need to consult your doctor or midwife.